Among the greatest moments of musical theatre is when lot 666, the chandelier of the Opéra Populaire, is illuminated by electric light to the haunting score of Andrew Lloyd Webber’s The Phantom of the Opera. There is no question as to why the show is the longest running in Broadway history, with the breathtaking music and timeless story. And this latest production from Cameron Mackintosh, currently on its national tour, is truly superb. Laurence Conner, who has also helmed new award-winning productions of Les Misérables and Miss Saigon, directed this production of Phantom in 2013. While the iconic Hal Prince production still runs on Broadway, the latest version introduces beautiful and elaborate new sets design by Paul Brown, and spectacular choreography from Scott Ambler. Conner’s vision still retains the brilliant, Tony-award winning costumes designed by Maria Björnson. Quentin Oliver Lee is commanding in the titular role, filling the auditorium with his magnificently trained operatic voice. No matter how great of an actor portrays this iconic character, the success of the role ultimately comes down to the voice. Not only must they sound dark and brooding at times, they have to show a great deal of range. Lee’s rich baritone vocals are perfectly suited for such a task, as he easily switches between intimidating and beautifully romantic. The actor also stands at six-and-a-half feet tall, giving his daunting character even more of an edge. His nuanced performance as the tortured genius is fantastic. Opposite Lee is the endlessly talented and charismatic Eva Tavares as Christine Daaé. It is fitting that her character has been taught by the angel of music, because Tavares’ voice is nothing short of angelic. The actor celebrated her 200th performance in the show Friday night, and her experience shows. Christine is a complex character, catapulting from the corps de ballet to center stage in the opera house’s new production of Hannibal. 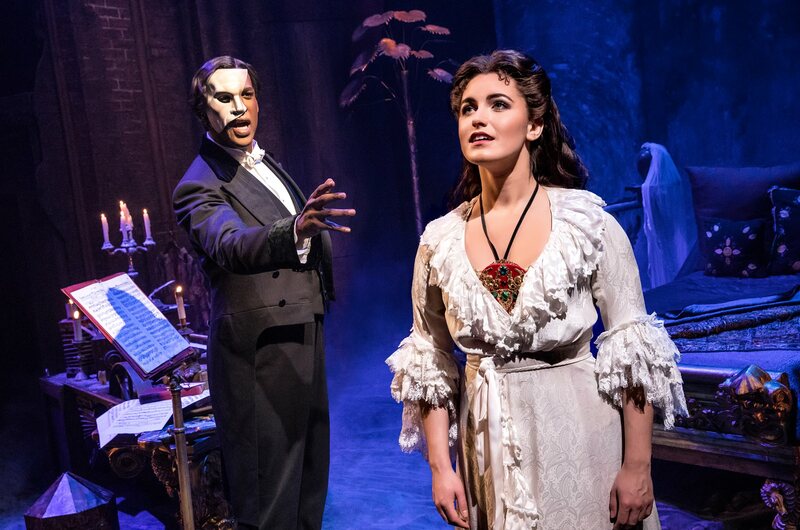 As she quickly transitions to this new role, she must balance her unique relationship with The Phantom and her childhood feelings for the opera’s benefactor Raoul (played by Jordan Craig). Tavares masterfully juggles a wide array of emotions, while beautifully portraying her feelings for both men. The set design by Paul Brown is the most impressive change in this production. Brown found new inspiration in Gaston Leroux’s novel, which is the basis for the show. Among the new elements from the book are the Phantom’s updated lair, which adds more insight into the character’s mind, and the extraordinary rotating cylindrical wall which leads Christine there. A stunning setpiece, the wall weighs over ten tons and houses a retractable set of stairs. 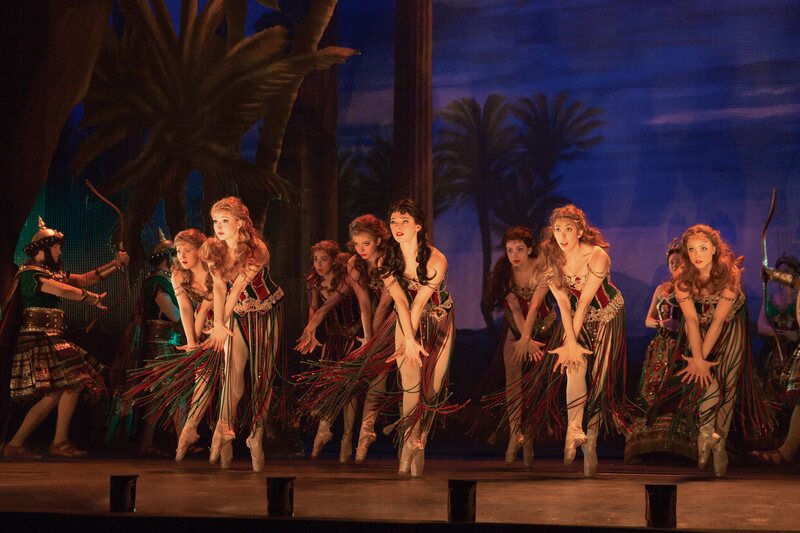 Watching the Phantom lead Christine down the moving wall is a thrilling experience. The Company performs “Masquerade.” Original Tour Cast. The opera house itself, with its lavish decor and brilliant sets within a set, make for beautiful imagery. Especially when paired with the gorgeous costumes. Another welcomed addition is a large mirror which hangs above the stage during “Masquerade,” which showcases Ambler’s choreography in a unique way. With a cast and orchestra of fifty-two, there is a lot to take in during the production. The music of Phantom is not only among Webber’s best work, yet also comprises one of the most popular albums in Broadway history. The orchestra, under the direction of Jamie Johns, magnificently performed the music of the night. 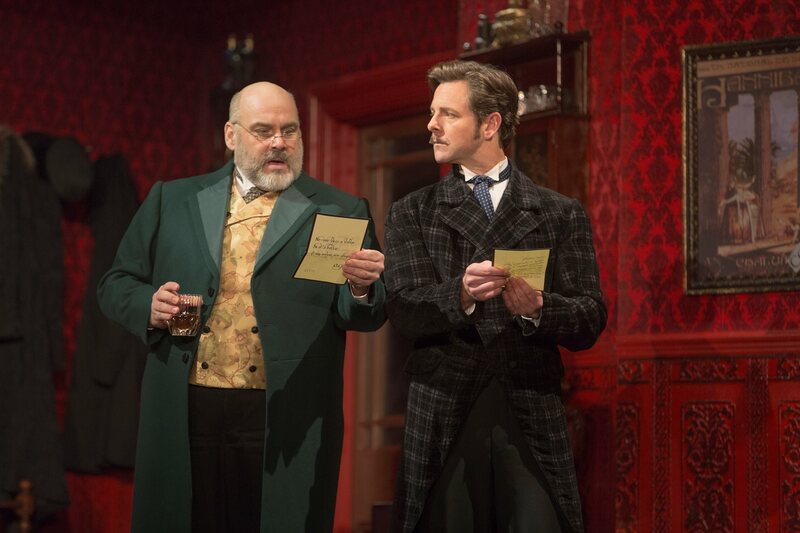 David Benoit and Edward Staudenmayer are fantastic as Firmin and Andre, the two proprietors of the opera house. Both actors are able to organically add levity to a show which gets quite dark at times. They have great chemistry together, and are consistently entertaining to watch as they try and run their troubled theatre. Trista Moldovan sounds fantastic as Carlotta, and has no problem playing up the role for laughs. Her performance during the Hannibal rehearsals and Il Muto were both hilarious. Phumziile Sojola was also great as Piangi, with a terrific voice as he plays off Moldovan very well. Adam Bashian also gives a praiseworthy comedic performance, wonderfully playing Don Attilio in the Il Muto number. The Phantom of the Opera is quite an experience. The audience gets to take in fantastic songs, while also enjoying flourishes of opera and ballet. Filled with beautiful sets and costumes, a timeless romance, and fantastic performances, there is much to marvel at from beginning to end. This production further develops the character of The Phantom, and is one which fans – both new and old – will appreciate. The Corps de Ballet in “Hannibal” – Choreography by Scott Ambler. Original Tour Cast. 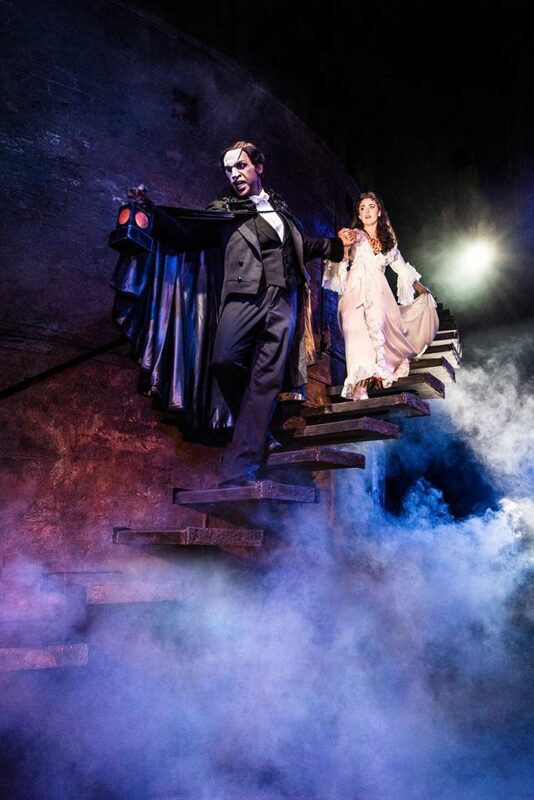 See ‘The Phantom of the Opera’ at the Fabulous Fox through May 20. Tickets are available at MetroTix. For more information, visit fabulousfox.com or the official tour site at thephantomoftheopera.com.